February's topic will be Google Guice presented by Steven P. Goldsmith, CEO of SG Enterprise Systems. Guice is a compelling DI framework that prefers the type safe nature of Java's annotations and generics over error prone String identifiers (cough, cough, Spring) and convoluted wiring methods. Food and beverages will be provided by John Holton of RITA Technologies. John was able to hook me up, so if you are looking for employment prospects get in contact with him. 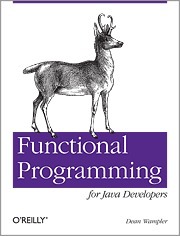 We will be giving away one copy of Functional Programming for Java Developers kindly donated by Dave Moskowitz. Wednesday, February 22nd at 6:00 PM.